LOST MY PARTNER blog: am I responsible for my spouse’s debts? 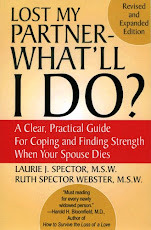 In addition to the trauma of your partner’s death, you may also face the burden of his or her financial debts. When is a surviving spouse not responsible for credit card debt? If a credit card is only in your spouse's name, the debt only belongs to your spouse (there are exceptions to this in community property states). Family members will not be responsible for the debt or forced to pay it. Even if you are a second cardholder on the account who has charging privileges, but it is not a joint account, you are not responsible for the remaining debt. If the card is only in your spouse's name, the estate is responsible for paying off the balance. The executor of the estate will use the assets to pay off the debts. If the estate doesn't have the money to pay the bill, then credit card companies must write it off and the account is closed. There are several instances when the surviving spouse is responsible for the credit card debt.If the card is a joint account, this means that your name is also listed on the account and the card is reported on your credit report. You will be responsible for the debt after your spouse dies. In addition, if you live in a community property state, you could also be responsible for the debt. Assets that are gained together during marriage are classified as joint property in these states.